The Statue of Liberty (Liberty Enlightening the World; French: La Liberté éclairant le monde) is a colossal neoclassical sculpture on Liberty Island in the middle of New York Harbor, in Manhattan, New York City. The statue, designed by Frédéric Auguste Bartholdi, a French sculptor and dedicated on October 28, 1886, was a gift to the United States from the people of France. 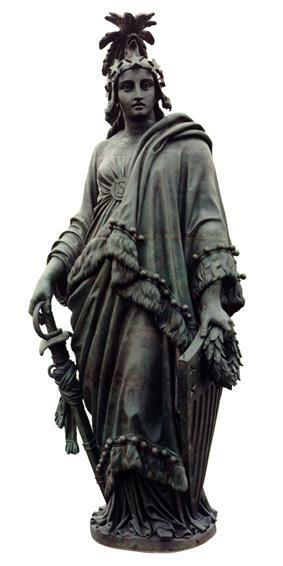 The statue is of a robed female figure representing Libertas, the Roman goddess of freedom, who bears a torch and a tabula ansata (a tablet evoking the law) upon which is inscribed the date of the American Declaration of Independence, July 4, 1776. A broken chain lies at her feet. The statue is an icon of freedom and of the United States: a welcoming signal to immigrants arriving from abroad. 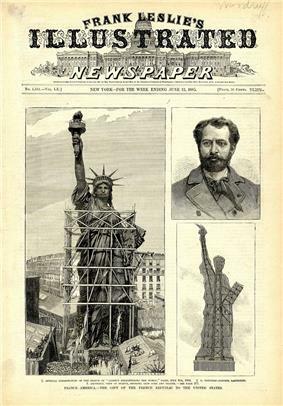 The origin of the Statue of Liberty project is sometimes traced to a comment made by French law professor and politician Édouard René de Laboulaye in mid-1865. In after-dinner conversation at his home near Versailles, Laboulaye, an ardent supporter of the Union in the American Civil War, is supposed to have said: "If a monument should rise in the United States, as a memorial to their independence, I should think it only natural if it were built by united effort—a common work of both our nations." The National Park Service, in a 2000 report, however, deemed this a legend traced to an 1885 fundraising pamphlet, and that the statue was most likely conceived in 1870. In another essay on their website, the Park Service suggested that Laboulaye was minded to honor the Union victory and its consequences, "With the abolition of slavery and the Union's victory in the Civil War in 1865, Laboulaye's wishes of freedom and democracy were turning into a reality in the United States. 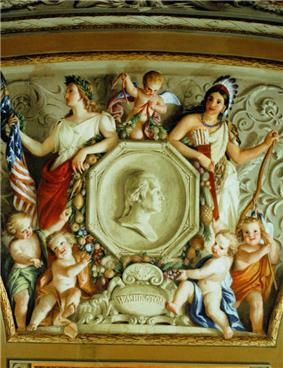 In order to honor these achievements, Laboulaye proposed that a gift be built for the United States on behalf of France. Laboulaye hoped that by calling attention to the recent achievements of the United States, the French people would be inspired to call for their own democracy in the face of a repressive monarchy." According to sculptor Frédéric Auguste Bartholdi, who later recounted the story, Laboulaye's comment was not intended as a proposal, but it inspired Bartholdi. Given the repressive nature of the regime of Napoleon III, Bartholdi took no immediate action on the idea except to discuss it with Laboulaye. 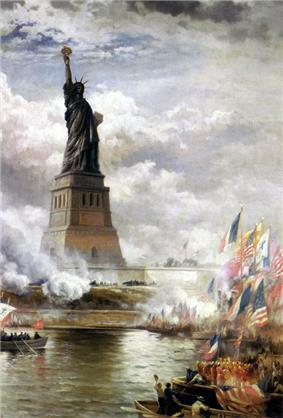 Bartholdi was in any event busy with other possible projects; in the late 1860s, he approached Isma'il Pasha, Khedive of Egypt, with a plan to build a huge lighthouse in the form of an ancient Egyptian female fellah or peasant, robed and holding a torch aloft, at the northern entrance to the Suez Canal in Port Said. Sketches and models were made of the proposed work, though it was never erected. There was a classical precedent for the Suez proposal, the Colossus of Rhodes: an ancient bronze statue of the Greek god of the sun, Helios. This statue is believed to have been over 100 feet (30 m) high, and it similarly stood at a harbor entrance and carried a light to guide ships. 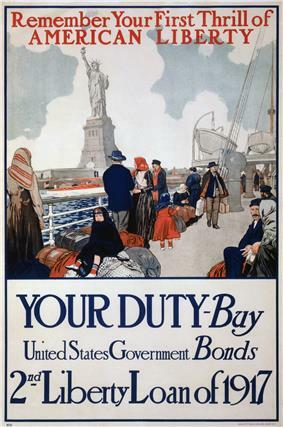 Arriving at New York Harbor, Bartholdi focused on Bedloe's Island as a site for the statue, struck by the fact that vessels arriving in New York had to sail past it. He was delighted to learn that the island was owned by the United States government—it had been ceded by the New York State Legislature in 1800 for harbor defense. It was thus, as he put it in a letter to Laboulaye: "land common to all the states." As well as meeting many influential New Yorkers, Bartholdi visited President Ulysses S. Grant, who assured him that it would not be difficult to obtain the site for the statue. Bartholdi crossed the United States twice by rail, and met many Americans he felt would be sympathetic to the project. But he remained concerned that popular opinion on both sides of the Atlantic was insufficiently supportive of the proposal, and he and Laboulaye decided to wait before mounting a public campaign. Bartholdi had made a first model of his concept in 1870. The son of a friend of Bartholdi's, American artist John LaFarge, later maintained that Bartholdi made the first sketches for the statue during his U.S. visit at La Farge's Rhode Island studio. Bartholdi continued to develop the concept following his return to France. He also worked on a number of sculptures designed to bolster French patriotism after the defeat by the Prussians. 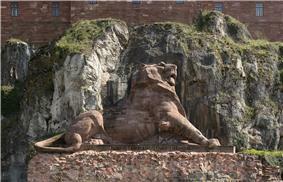 One of these was the Lion of Belfort, a monumental sculpture carved in sandstone below the fortress of Belfort, which during the war had resisted a Prussian siege for over three months. The defiant lion, 73 feet (22 m) long and half that in height, displays an emotional quality characteristic of Romanticism, which Bartholdi would later bring to the Statue of Liberty. Artists of the 18th and 19th centuries striving to evoke republican ideals commonly used representations of Libartas as an allegorical symbol. 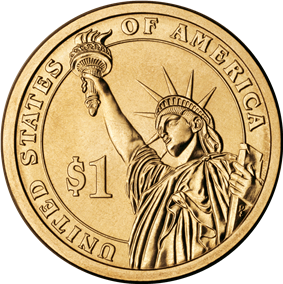 A figure of Liberty was also depicted on the Great Seal of France. However, Bartholdi and Laboulaye avoided an image of revolutionary liberty such as that depicted in Eugène Delacroix's famed Liberty Leading the People (1830). In this painting, which commemorates France's Revolution of 1830, a half-clothed Liberty leads an armed mob over the bodies of the fallen. Laboulaye had no sympathy for revolution, and so Bartholdi's figure would be fully dressed in flowing robes. Instead of the impression of violence in the Delacroix work, Bartholdi wished to give the statue a peaceful appearance and chose a torch, representing progress, for the figure to hold. Bartholdi made alterations in the design as the project evolved. Bartholdi considered having Liberty hold a broken chain, but decided this would be too divisive in the days after the Civil War. The erected statue does rise over a broken chain, half-hidden by her robes and difficult to see from the ground. Bartholdi was initially uncertain of what to place in Liberty's left hand; he settled on a tabula ansata, a keystone-shaped tablet used to evoke the concept of law. Though Bartholdi greatly admired the United States Constitution, he chose to inscribe "JULY IV MDCCLXXVI" on the tablet, thus associating the date of the country's Declaration of Independence with the concept of liberty. Bartholdi interested his friend and mentor, architect Eugène Viollet-le-Duc, in the project. As chief engineer, Viollet-le-Duc designed a brick pier within the statue, to which the skin would be anchored. After consultations with the metalwork foundry Gaget, Gauthier & Co., Viollet-le-Duc chose the metal which would be used for the skin, copper sheets, and the method used to shape it, repoussé, in which the sheets were heated and then struck with wooden hammers. An advantage of this choice was that the entire statue would be light for its volume, as the copper need be only .094 inches (2.4 mm) thick. Bartholdi had decided on a height of just over 151 feet (46 m) for the statue, double that of Italy's Colosso di San Carlo Borromeo and the German statue of Arminius, both made with the same method. Despite its initial focus on the elites, the Union was successful in raising funds from across French society. Schoolchildren and ordinary citizens gave, as did 181 French municipalities. Laboulaye's political allies supported the call, as did descendants of the French contingent in the American Revolutionary War. Less idealistically, contributions came from those who hoped for American support in the French attempt to build the Panama Canal. The copper may have come from multiple sources and some of it is said to have come from a mine in Visnes, Norway, though this has not been conclusively determined after testing samples. According to Cara Sutherland in her book on the statue for the Museum of the City of New York, 90,800 kilos (200,000 pounds) was needed to build the statue, and the French copper industrialist Eugène Secrétan donated 58,100 kilos (128,000 pounds) of copper. Historian Yasmin Khan, in her 2010 book about the statue, states that the firm of Japy Frères, copper merchants, donated copper valued at 64,000 francs (about $16,000 at the time or the equivalent of US$ 354,000 in 2015). Hunt's pedestal design contains elements of classical architecture, including Doric portals, as well as some elements influenced by Aztec architecture. The large mass is fragmented with architectural detail, in order to focus attention on the statue. In form, it is a truncated pyramid, 62 feet (19 m) square at the base and 39.4 feet (12.0 m) at the top. The four sides are identical in appearance. Above the door on each side, there are ten disks upon which Bartholdi proposed to place the coats of arms of the states (between 1876 and 1889, there were 40 U.S. states), although this was not done. Above that, a balcony was placed on each side, framed by pillars. Bartholdi placed an observation platform near the top of the pedestal, above which the statue itself rises. According to author Louis Auchincloss, the pedestal "craggily evokes the power of an ancient Europe over which rises the dominating figure of the Statue of Liberty". The committee hired former army General Charles Pomeroy Stone to oversee the construction work. Construction on the 15-foot-deep (4.6 m) foundation began in 1883, and the pedestal's cornerstone was laid in 1884. In Hunt's original conception, the pedestal was to have been made of solid granite. Financial concerns again forced him to revise his plans; the final design called for poured concrete walls, up to 20 feet (6.1 m) thick, faced with granite blocks. This Stony Creek granite came from the Beattie Quarry in Branford, Connecticut. The concrete mass was the largest poured to that time. Joseph Pulitzer, publisher of the New York World, a New York newspaper, announced a drive to raise $100,000 – the equivalent of $2.3 million today. Pulitzer pledged to print the name of every contributor, no matter how small the amount given. The drive captured the imagination of New Yorkers, especially when Pulitzer began publishing the notes he received from contributors. "A young girl alone in the world" donated "60 cents, the result of self denial." One donor gave "five cents as a poor office boy's mite toward the Pedestal Fund." A group of children sent a dollar as "the money we saved to go to the circus with." Another dollar was given by a "lonely and very aged woman." Residents of a home for alcoholics in New York's rival city of Brooklyn – the cities would not merge until 1898 – donated $15; other drinkers helped out through donation boxes in bars and saloons. A kindergarten class in Davenport, Iowa, mailed the World a gift of $1.35. As the donations flooded in, the committee resumed work on the pedestal. On June 17, 1885, the French steamer Isère, laden with the Statue of Liberty, reached the New York port safely. New Yorkers displayed their new-found enthusiasm for the statue, as the French vessel arrived with the crates holding the disassembled statue on board. Two hundred thousand people lined the docks and hundreds of boats put to sea to welcome the Isère. After five months of daily calls to donate to the statue fund, on August 11, 1885, the World announced that $102,000 had been raised from 120,000 donors, and that 80 percent of the total had been received in sums of less than one dollar. Even with the success of the fund drive, the pedestal was not completed until April 1886. Immediately thereafter, reassembly of the statue began. Eiffel's iron framework was anchored to steel I-beams within the concrete pedestal and assembled. Once this was done, the sections of skin were carefully attached. Due to the width of the pedestal, it was not possible to erect scaffolding, and workers dangled from ropes while installing the skin sections. Nevertheless, no one died during the construction. 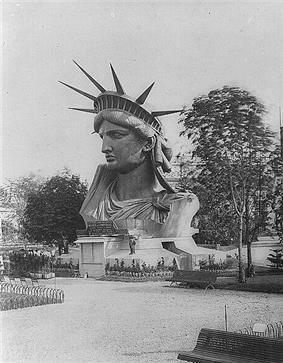 Bartholdi had planned to put floodlights on the torch's balcony to illuminate it; a week before the dedication, the Army Corps of Engineers vetoed the proposal, fearing that ships' pilots passing the statue would be blinded. Instead, Bartholdi cut portholes in the torch – which was covered with gold leaf – and placed the lights inside them. A power plant was installed on the island to light the torch and for other electrical needs. After the skin was completed, renowned landscape architect Frederick Law Olmsted, co-designer of New York's Central Park and Brooklyn's Prospect Park, supervised a cleanup of Bedloe's Island in anticipation of the dedication. A ceremony of dedication was held on the afternoon of October 28, 1886. President Grover Cleveland, the former New York governor, presided over the event. On the morning of the dedication, a parade was held in New York City; estimates of the number of people who watched it ranged from several hundred thousand to a million. President Cleveland headed the procession, then stood in the reviewing stand to see bands and marchers from across America. General Stone was the grand marshal of the parade. The route began at Madison Square, once the venue for the arm, and proceeded to Battery Park at the southern tip of Manhattan by way of Fifth Avenue and Broadway, with a slight detour so the parade could pass in front of the World building on Park Row. As the parade passed the New York Stock Exchange, traders threw ticker tape from the windows, beginning the New York tradition of the ticker-tape parade. A nautical parade began at 12:45 p.m., and President Cleveland embarked on a yacht that took him across the harbor to Bedloe's Island for the dedication. De Lesseps made the first speech, on behalf of the French committee, followed by the chairman of the New York committee, Senator William M. Evarts. A French flag draped across the statue's face was to be lowered to unveil the statue at the close of Evarts's speech, but Bartholdi mistook a pause as the conclusion and let the flag fall prematurely. The ensuing cheers put an end to Evarts's address. President Cleveland spoke next, stating that the statue's "stream of light shall pierce the darkness of ignorance and man's oppression until Liberty enlightens the world". Bartholdi, observed near the dais, was called upon to speak, but he refused. Orator Chauncey M. Depew concluded the speechmaking with a lengthy address. Originally, the statue was a dull copper color, but shortly after 1900 a green patina, also called verdigris, caused by the oxidation of the copper skin, began to spread. As early as 1902 it was mentioned in the press; by 1906 it had entirely covered the statue. Accepting a view that the patina was evidence of corrosion, Congress authorized $62,800 for various repairs, and to paint the statue both inside and out. There was considerable public protest against the proposed exterior painting. The Army Corps of Engineers studied the patina for any ill effects to the statue and concluded that it protected the skin, "softened the outlines of the Statue and made it beautiful." The statue was painted only on the inside. The Corps of Engineers also installed an elevator to take visitors from the base to the top of the pedestal. On July 30, 1916, during World War I, German saboteurs set off a disastrous explosion on the Black Tom peninsula in Jersey City, New Jersey, in what is now part of Liberty State Park, close to Bedloe's Island. Carloads of dynamite and other explosives that were being sent to Britain and France for their war efforts were detonated, and seven people were killed. The statue sustained minor damage, mostly to the torch-bearing right arm, and was closed for ten days. The cost to repair the statue and buildings on the island was about $100,000. The narrow ascent to the torch was closed for public safety reasons, and it has remained closed ever since. That same year, Mount Rushmore, redesigned the torch, replacing much of the original copper with stained glass. On December 2, 1916, President Woodrow Wilson pressed the telegraph key that turned on the lights, successfully illuminating the statue. In 1933, President Franklin Roosevelt ordered the statue transferred to the National Park Service (NPS). In 1937, the NPS gained jurisdiction over the rest of Bedloe's Island. With the Army's departure, the NPS began to transform the island into a park. The Works Progress Administration (WPA) demolished most of the old buildings, regraded and reseeded the eastern end of the island, and built granite steps for a new public entrance to the statue from its rear. The WPA also carried out restoration work within the statue, temporarily removing the rays from the statue's halo so their rusted supports could be replaced. Rusted cast-iron steps in the pedestal were replaced with new ones made of reinforced concrete; the upper parts of the stairways within the statue were replaced, as well. Copper sheathing was installed to prevent further damage from rainwater that had been seeping into the pedestal. The statue was closed to the public from May until December 1938. 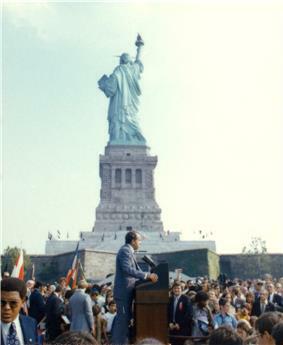 In 1984, the statue was closed to the public for the duration of the renovation. Workers erected the world's largest free-standing scaffold, which obscured the statue from view. Liquid nitrogen was used to remove layers of paint that had been applied to the interior of the copper skin over decades, leaving two layers of coal tar, originally applied to plug leaks and prevent corrosion. Blasting with baking soda powder removed the tar without further damaging the copper. The restorers' work was hampered by the asbestos-based substance that Bartholdi had used – ineffectively, as inspections showed – to prevent galvanic corrosion. Workers within the statue had to wear protective gear, dubbed "moon suits", with self-contained breathing circuits. Larger holes in the copper skin were repaired, and new copper was added where necessary. The replacement skin was taken from a copper rooftop at Bell Labs, which had a patina that closely resembled the statue's; in exchange, the laboratory was provided some of the old copper skin for testing. The torch, found to have been leaking water since the 1916 alterations, was replaced with an exact replica of Bartholdi's unaltered torch. Consideration was given to replacing the arm and shoulder; the National Park Service insisted that they be repaired instead. Following the Bush administration. New York Congressman Anthony Weiner made the statue's reopening a personal crusade. On May 17, 2009, President Barack Obama's Secretary of the Interior, Ken Salazar, announced that as a "special gift" to America, the statue would be reopened to the public as of July 4, but that only a limited number of people would be permitted to ascend to the crown each day. The statue, including the pedestal and base, closed on October 29, 2011 for installation of new elevators and staircases and to bring other facilities, such as restrooms, up to code. The statue was closed to the public until October 28, 2012. A day after the reopening, the statue closed again due to Hurricane Sandy. Although the storm did not harm the statue, it destroyed some of the infrastructure on both Liberty Island and Ellis Island, severely damaging the dock used by the ferries bearing visitors to the statue. On November 8, 2012, a Park Service spokesperson announced that both islands would remain closed for an indefinite period for repairs to be done. Due to lack of electricity on Liberty Island, a generator was installed to power temporary floodlights to illuminate the statue at night. The superintendent of Statue of Liberty National Monument, David Luchsinger, whose home on the island was severely damaged, stated that it would be "optimistically ... months" before the island was reopened to the public. The statue and Liberty Island reopened to the public on July 4, 2013. Ellis Island remained closed for repairs for several more months but reopened in late October 2013. For part of October 2013, Liberty Island was closed to the public due to the United States federal government shutdown of 2013, along with other publicly funded museums, parks, monuments, construction projects and buildings. 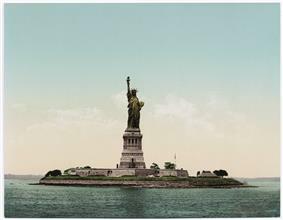 The statue is situated in Upper New York Bay on Liberty Island, south of Ellis Island. Both islands were ceded by New York to the federal government in 1800. As agreed in an 1834 compact between New York and New Jersey that set the state border at the bay's midpoint, the original islands remain New York territory despite their location on the New Jersey side of the state line. Land created by reclamation at Ellis is New Jersey territory. No charge is made for entrance to Statue of Liberty National Monument, but there is a cost for the ferry service that all visitors must use, as private boats may not dock at the island. 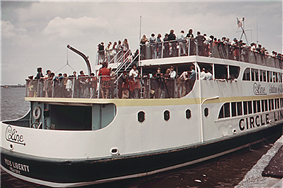 A concession was granted in 2007 to Statue Cruises to operate the transportation and ticketing facilities, replacing Circle Line, which had operated the service since 1953. The ferries, which depart from Liberty State Park in Jersey City and Battery Park in Lower Manhattan, also stop at Ellis Island when it is open to the public, making a combined trip possible. All ferry riders are subject to security screening, similar to airport procedures, prior to boarding. Visitors intending to enter the statue's base and pedestal must obtain a complimentary museum/pedestal ticket along with their ferry ticket. Those wishing to climb the staircase within the statue to the crown purchase a special ticket, which may be reserved up to a year in advance. A total of 240 people per day are permitted to ascend: ten per group, three groups per hour. Climbers may bring only medication and cameras—lockers are provided for other items—and must undergo a second security screening. Plaque honoring poet Emma Lazarus, with the text of "The New Colossus"
There are several plaques and dedicatory tablets on or near the Statue of Liberty. A plaque on the copper just under the figure in front declares that it is a colossal statue representing Liberty, designed by Bartholdi and built by the Paris firm of Gaget, Gauthier et Cie (Cie is the French abbreviation analogous to Co.). A presentation tablet, also bearing Bartholdi's name, declares the statue to be a gift from the people of the Republic of France that honors "the Alliance of the two Nations in achieving the Independence of the United States of America and attests their abiding friendship." There is a tablet placed by the New York committee that commemorates the fundraising done to build the pedestal. The cornerstone also bears a plaque placed by the Freemasons. 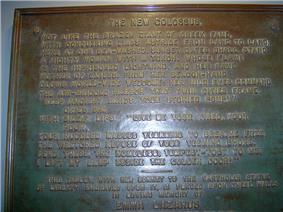 In 1903, a bronze tablet that bears the text of "The New Colossus" and commemorates Emma Lazarus was presented by friends of the poet. 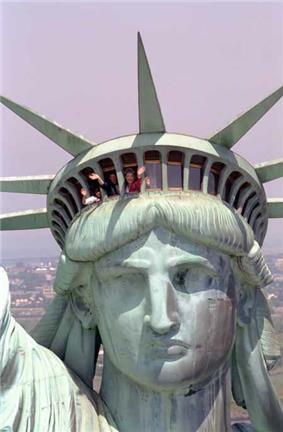 Until the 1986 renovation, it was mounted inside the pedestal; today it resides in the Statue of Liberty Museum in the base. It is accompanied by a tablet given by the Emma Lazarus Commemorative Committee in 1977, celebrating the poet's life. A group of statues stands at the western end of the island, honoring those closely associated with the Statue of Liberty. Two Americans—Pulitzer and Lazarus—and three Frenchmen—Bartholdi, Laboulaye, and Eiffel—are depicted. They are the work of Maryland sculptor Phillip Ratner. 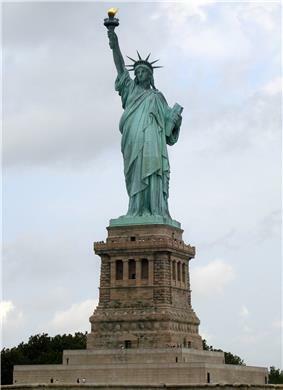 Hundreds of replicas of the Statue of Liberty are displayed worldwide. A smaller version of the statue, one-fourth the height of the original, was given by the American community in Paris to that city. It now stands on the Île aux Cygnes, facing west toward her larger sister. 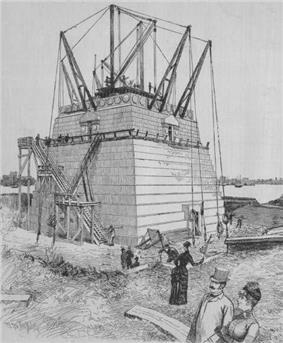 A replica 30 feet (9.1 m) tall stood atop the Liberty Warehouse on West 64th Street in Manhattan for many years; it now resides at the Brooklyn Museum. In a patriotic tribute, the Boy Scouts of America, as part of their Strengthen the Arm of Liberty campaign in 1949–1952, donated about two hundred replicas of the statue, made of stamped copper and 100 inches (2,500 mm) in height, to states and municipalities across the United States. Though not a true replica, the statue known as the Goddess of Democracy temporarily erected during the Tiananmen Square protests of 1989 was similarly inspired by French democratic traditions—the sculptors took care to avoid a direct imitation of the Statue of Liberty. 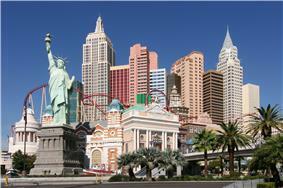 Among other recreations of New York City structures, a replica of the statue is part of the exterior of the New York-New York Hotel and Casino in Las Vegas. Depictions of the statue have been used by many regional institutions. Between 1986 and 2000, New York State issued license plates featuring the statue. The Women's National Basketball Association's New York Liberty use both the statue's name and its image in their logo, in which the torch's flame doubles as a basketball. The New York Rangers of the National Hockey League depicted the statue's head on their third jersey, beginning in 1997. The National Collegiate Athletic Association's 1996 Men's Basketball Final Four, played at New Jersey's Meadowlands Sports Complex, featured the statue in its logo. The Libertarian Party of the United States uses the statue in its emblem. Where would science fiction be without the Statue of Liberty? For decades it has towered or crumbled above the wastelands of deserted [E]arth—giants have uprooted it, aliens have found it curious ... the symbol of Liberty, of optimism, has become a symbol of science fiction's pessimistic view of the future." ^ a b "Statue of Liberty National Monument". ^ "National Monument Proclamations under the Antiquities Act". National Park Service. January 16, 2003. Retrieved October 12, 2011. ^ National Park Service (1994). National Register of Historic Places, 1966–1994: Cumulative List Through January 1, 1994. Washington DC: National Park Service. p. 502. ^ "New Jersey and National Registers of Historic Places - Hudson County". ^ a b c d e Bodnar, John (2006). "Monuments and Morals: The Nationalization of Civic Instruction". In Warren, Donald R.; Patrick, John J. Civic and Moral Learning in America. New York: Macmillan. pp. 212–214. ^ a b c Turner, Jane (2000). The Grove Dictionary of Art: From Monet to Cézanne : Late 19th-century French Artists. New York: Oxford University Press US. p. 10. ^ "Frequently asked questions". Statue of Liberty National Monument. National Park Service. Retrieved August 10, 2010. ^ "News of Norway" (4). 1999. Retrieved July 29, 2010. ^ a b c Khan 2010, p. 137. ^ "La tour a vu le jour à Levallois". Le Parisien (in Français). April 30, 2004. Retrieved December 8, 2012. ^ "Branford’s History Is Set in Stone". Connecticut Humanities. ^ "The Isere-Bartholdi Gift Reaches the Horsehoe Safely". The Evening Post. June 17, 1885. Retrieved February 11, 2013. 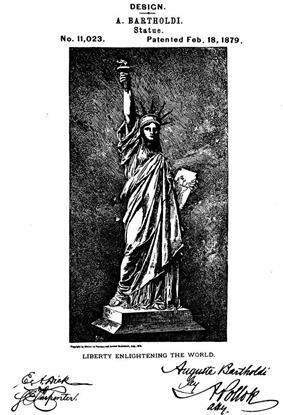 ^ "Postponing Bartholdi's statue until there is liberty for colored as well". The Cleveland Gazette (Cleveland, Ohio). November 27, 1886. p. 2. ^ Daw, Jocelyne (March 2006). Cause Marketing for Nonprofits: Partner for Purpose, Passion, and Profits. Hoboken, New Jersey: John Wiley & Sons. p. 4. ^ "Statue of Liberty interior to re-open next month". AP via Sacramento Bee. 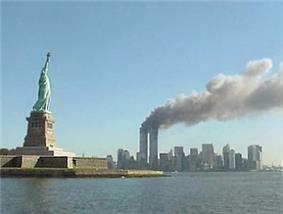 September 11, 2012. Retrieved September 12, 2012. ^ Powlowski, A. (November 2, 2012). "'"Statue of Liberty closed for 'foreseeable future. NBC News. Retrieved November 2, 2012. ^ "Early History of Bedloe's Island". Statue of Liberty Historical Handbook. National Park Service. Retrieved October 20, 2011. ^ a b c Moreno 2000, pp. 222–223. ^ "Statue of Liberty postage stamps". Statue of Liberty-Ellis Island Foundation, Inc. Retrieved October 20, 2011. ^ "The redesigned $10 note". newmoney.gov. Bureau of Engraving and Printing. Retrieved October 20, 2011. ^ "State to start issuing new license plates July 1". The New York Times. January 24, 1986. Retrieved October 20, 2011. ^ "State license plates to get new look". The New York Times. January 11, 2000. Retrieved October 20, 2011. ^ Liberty' for New York club"'". The New York Times. February 14, 1997. Retrieved October 20, 2011. ^ Axinn, Mark (October 28, 2011). "The Statue of Liberty after 125 years - by LPNY Chair Mark Axinn". ^ Greene, Eric; Slotkin, Richard (1998). Planet of the Apes as American myth: race, politics, and popular culture. Middletown, Connecticut: Wesleyan University Press. p. 52. ^ Darrach, Brad (June 26, 1970). "The spy who came in from 1882". Life (New York). p. 16. Retrieved October 20, 2011. Bell, James B.; Abrams, Richard L. (1984). In Search of Liberty: The Story of the Statue of Liberty and Ellis Island. Garden City, New York: Doubleday & Co.
Harris, Jonathan (1985). A Statue for America: The First 100 Years of the Statue of Liberty. New York City: Four Winds Press (a division of Macmillan Publishing Company). Hayden, Richard Seth; Despont, Thierry W. (1986). Restoring the Statue of Liberty. New York City: McGraw-Hill Book Company. Khan, Yasmin Sabina (2010). 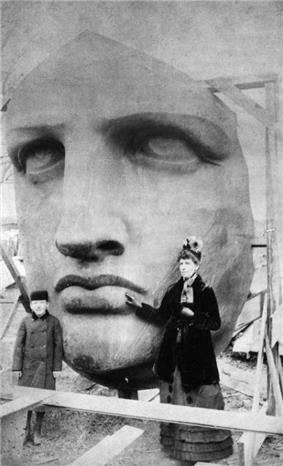 Enlightening the World: The Creation of the Statue of Liberty. Ithaca, New York: Cornell University Press. Moreno, Barry (2000). The Statue of Liberty Encyclopedia. New York City: Simon & Schuster. Sutherland, Cara A. (2003). The Statue of Liberty. New York City: Barnes & Noble Books. Soleia Company Preserved and repurposes artifacts from the centennial restoration of the Statue of Liberty National Monument.